An absolutely stunning four bedroom house, arranged over four floors and situated on the fabulous Musgrave Crescent; comprising of two reception rooms, a beautiful kitchen and striking rear garden. Musgrave Crescent is a wonderfully quiet residential road set opposite the picturesque Eel Brook Common and only moments away from the vibrant Fulham Broadway which offers a wealth of shops, restaurants, transport and amenities. 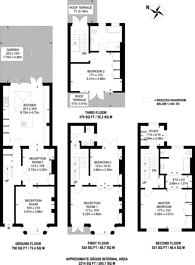 2,214 (205 Sq M) approx. We have over 1,000 property market reports for locations across London and Surrey - including SW6 and Moore Park Estate.